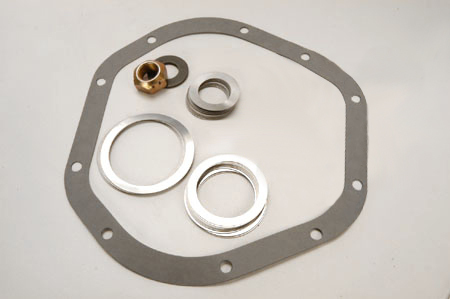 This is a shim kit for the Dana-27 axle used in Scout 80 vehicles (both front and rear), and on some Scout 800s (front only). This will also fit some early Jeep and Willys vehicles. You will need this kit if you decide to change your gears for any reason. The shims are necessary to ensure proper gear wear and preload. Improper installation can result in gear damage and failure. Each kit comes with carrier shims, pinion shims, a new pinion nut and washer, and a fiberglass-reinforced differential cover gasket. Kit shown in photo is for Dana-44, but Dana-27 kit is similar.